Salvia Miltiorrhiza, Panax Pseudo-ginseng var. Notoginseng, Crude Pollen Typhae, Peach Kernel, Safflower, Angelica Sinensis, Red Paeonia. 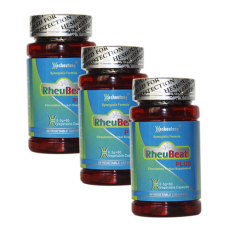 RheuBeatPlus is used for breaking blockage of circulation due to blood blockage.